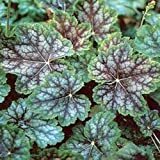 Heuchera americana growing leaf plant of the genus Heuchera also known as American alumroot, Heuchera americana perennial evergreen used as ornamental ground cover plant, can grow in temperate cold subtropics or cold mediterranean climate or as houseplant and growing in hardiness zone 4-10a. Leaves color green, green with purple, green with white or green with red, leaves shape round lobed. Flower color can be: white, purple or pink grows on stems in inflorescence. 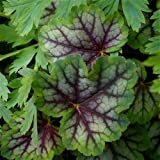 HEIRLOOM NON GMO Heuchera Americana Seeds Coral Bells 50 seeds "SHADE"